Karen joined our dental team in September 2018 bringing 20 years of dental experience. She graduated in 1998 from Mercer County Technical Education Center in Princeton, West Virginia as a certified Dental Assistant. 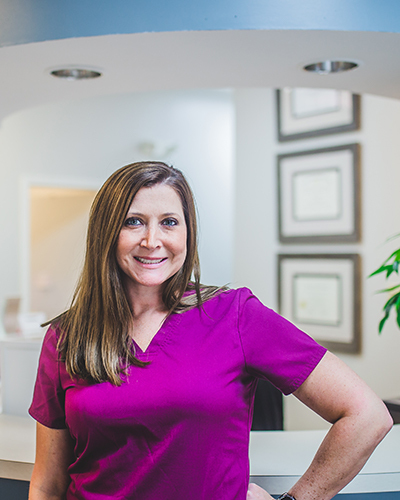 After she graduated, she wanted to better her career and moved to Roanoke, VA. Over the years, she has become well seasoned in many aspects of the dental field including Office Manager, Delta Dental Claims Auditor, Dental Assistant, and as a Patient Care Coordinator. 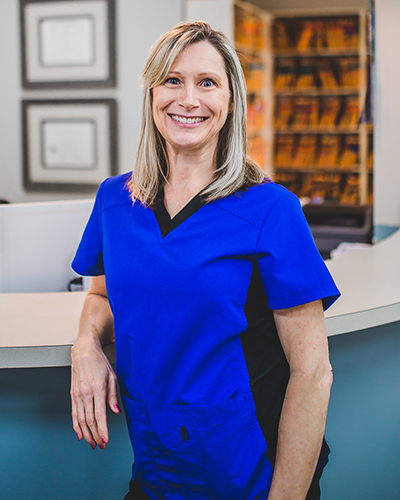 Karen is always eager to help our patients with their dental goals and will help you with a smile to get you the financial options you or to check on your Dental benefits. Karen has always kept dentistry as her number one passion as she loves to smile and loves seeing our patients smile. Patients love her outgoing personality. In her spare time, Karen loves spending time with her husband, Tom, her soon to be Eagle-scout son, Alex, and her silly dog. She loves watching her Mountaineers football even though her son is a Hokie! Karen also loves traveling and her food very spicy and hot. Martha, our dental hygienist actually ENJOYS cleaning teeth, answering questions about periodontal disease (what? ), and proper dental cleansing techniques. Just ask her – she has several tips and suggestions to achieve and maintain optimal dental health. Martha and her husband live on a farm in Franklin County. They have been married for ~39 years and have three grown sons. Martha enjoys music, gardening, hiking, and traveling with friends. Peyton graduated from Northside High School in 2008. She married her High School sweetheart, Jamie. Together, Peyton and Jamie have 3 boys: JJ, Dalton, and Josey. Peyton has been working with Dr. Rhodes for almost 2 years. In her free time, she enjoys reading, relaxing, and drinking coffee. Originally from Fincastle, Va. Brandie now resides in Franklin County, Va. with her husband Justin of 17 years and Daughter and son (Justice 20, Tyler 16). Brandie started her career as a dental assistant January 2002. Brandie enjoys all aspects of dentistry, but especially enjoys building relationships with the patients. She is wonderful at comforting them when they are nervous or just trying to make them laugh and be more at ease in the dental chair! Our office is fun and upbeat we take the time to listen to your needs and we promise to make your visit to our office as pleasant as possible. YOUR SMILE IS OUR PASSION. Brandie is an avid animal lover, she also likes to shoot guns, cook, read and work puzzles in her spare time. Tammy has worked in the dental field for over 11 years. Having been both a chair side assistant, as well as a front office receptionist, Tammy loves all aspects of Dentistry. For the past 8 years, Tammy has had the opportunity to be a part of the Mission of Mercy, a wonderful organization that provides free dental care to individuals in needs. This experience increased Tammy’s already strong passion for helping others within the dental field.